New Orleans Georgia is scaring the Republicans. Barriers to voter registration dropped over the last two years as the result of lawsuits and legislative action that made registration and renewal more accessible through automatic procedures that allow a voter to opt out of registering, but otherwise enfranchise them. The results have been significant. Reporting in the Wall Street Journal indicated that the change “helped fuel a 15% increase in Georgia’s active voter rolls to about 6.3 million in September from about 5.5 million in November 2016. Black registered voters rose 15%, Hispanic voters 40%, and Asian and Pacific Islander voters rose 36%. The number of women who are registered to vote increased 13% in the period and white registered voters went up by about 10%.” All of that seems like good news, except for one simple fact, which the Republicans have understood very well for years. Once you reduce the barriers, more potential voters are enfranchised. Given demographic changes in Georgia and the growth of minority populations that means that more of this enlarged pool tends to favor Democratic candidates. 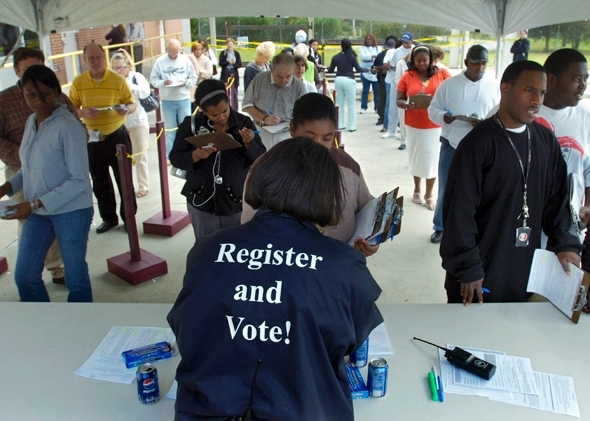 Thirteen states and the District of Columbia have voter registration laws that roughly align with Georgia’s. All of which is why Republicans in many states attempt to suppress the vote. Leveling the playing field so that it balances evenly with democratic governance based on voter accountability is a good thing for everyone, regardless of the partisan politics that tries to tilt towards authoritarianism. Registration alone just signs up all of the players. It doesn’t put them into the game. An Oregon political scientist found that despite the 5% increase in that state’s registration, the “turnout effects were relatively modest” with about 30% of the new registrants voting. New registrants who enroll after aggressive outreach and registration campaigns tend to vote in higher percentages than the rest of the population, but the Oregon figures seem to indicate that default auto-registrants are less motivated, so their participation would more likely be triggered by the campaign. Voter registration periods for the mid-terms in many states like Arkansas, Mississippi, and Louisiana for example are now over, so the real push now has to be to get people out to vote. Community radio stations are being encouraged to run GOTV public service announcements in regular rotation to keep the election date and the importance of voting in front of citizens. For the next month this needs to be a constant push. How could that be a bad thing? Let’s get it done! Portland The Grassroots Radio Coalition is an ad hoc group of noncommercial, community radio outlets around the United States that came together more than twenty years ago, initially in 1996, to provide support and create community to stations that were countering the rapid advance of commercialization in all of the airwaves. Their main event is an annual meeting, sort of a gathering of the tribes. Several years ago, they happened to meet in Hot Springs, Arkansas, so a group of us went down to welcome them at their opening reception. We met some good people in that quick visit. This year they were meeting at the Native American Student Center connected to Pacific State University in Portland, Oregon. There was excitement at this meeting because KBOO, the 25,000-watt FM noncommercial in the city was celebrating its 50th anniversary. Through a fortuitous chain of events, I was invited to be their keynote speaker in an unexpected honor coinciding with the season, so to speak, the season of resistance. The overlap between our small band of community radio stations, KABF, WDSV, WAMF and acornradio.org gave us some history and credentials as well as our historic connect to Lorenzo Milam, the godfather of community radio. As I discovered in Portland, that was only part of it. There was an interest in organizing, and they had heard – and in some cases had seen – the documentary, “The Organizer,” and were aware of Nuts and Bolts: The ACORN Fundamentals of Organizing. As always, the most interesting thing to me was hearing the questions and sentiments from the audience of more than eighty people on this last event of their multi-day conferences. Many of the audience were longtime radio veterans, ninjas on the technical side in some cases and veteran hosts and news people on the other. I managed to lure in some organizing wizards as well, including my old companero, Peter Cervantes-Gautschi, who I knew well from our time with Enlace, Alex King, a former head organizer for Seattle ACORN now living in the area, and some other old and new organizing friends and comrades. One of them commented after the session that I was “working a tough room,” but it didn’t feel that way at the time. Sure, the questions about reformism, ideology, and environmental work that were of interest to some were raised, but all of that is fair game from my experience bee-bopping around the country over the last year. More interesting were the questions about “next steps,” how to meet the demands of the current time when radio has the opportunity to provide a megaphone for the “voice of the people,” as we refer to our stations, and, frankly, how to build organizations to do the job. I sold out all of all eighteen copies of Nuts and Bolts that I had with me which was nice, but I was blown away by the number of people who came up to me after the session and offered to help whether or was volunteering on engineering, legal, or even building stations to support our African operations. I met people from other stations around ours as well which might come to something. I had thrown out the suggestion that stations create a database or pool of used equipment that was serviceable, but that they had replaced or outgrown that could be used to seed new stations here and there, and I even got big, fat bites on that one. My only disappointment came when I threw an easy softball to the audience and asked how many were running PSAs every 30- or 60-minutes encouraging listeners to register to vote and then to get out the vote, like we were doing on all the stations we manage and support. I had thought all of the hands would be in the air, but instead there was only one lonely hand raised by a woman standing in the back of the room. I gave her a shout out and asked where she was from, and it turned out to be a station in Ventura, California. I hadn’t asked to embarrass the GRC community, but hoped some will get on the GOTV bandwagon before it’s too late. Grassroots Radio Coalition. Keep an ear open for any stations that are part of these gatherings, because these are some great people on a wonderfully honorable mission. Please enjoy Border Towns by the Cravens.